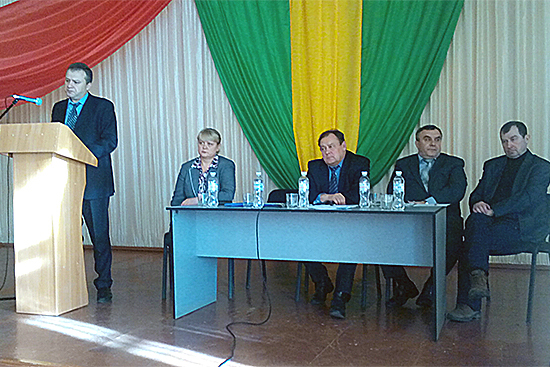 December meeting of the Academic Council of Luhansk Taras Shevchenko National University was held on December, 26. Meeting of the Academic Council of Luhansk Taras Shevchenko National University was held at the assembly hall of Starobilsk Professional Lyceum. The agenda included the following issues: progress of program of implementing university strategic development for 2009-2015; arrangement of professional orientation and advertisement work at the university for 2015. 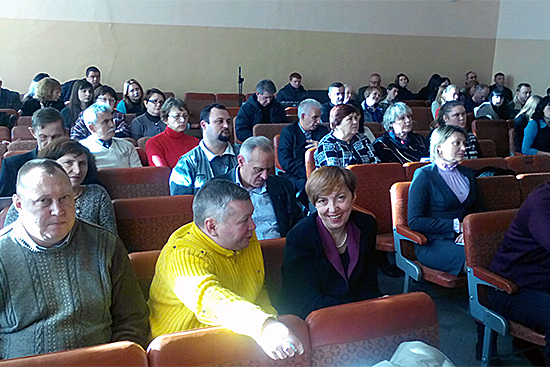 Development strategy was described by several speakers, in particular, by prorectors for scientific and pedagogical work Serhii Savchenko, Dmytro Uzhchenko, Olena Klimochkina, Oleksandr Babichev and others. So, having heard and discussed speakers’ reports the Academic Council noted that for the last five years the university staff was working fruitfully on implementation of tasks of Conception of University Strategy Development for 2009-2015. Unfortunately the implementation of all tasks of Conception of University Strategy Development was interrupted by difficult situation in the East of Ukraine, occupation of Luhansk and located in it main university buildings. Now the university is situated in the City of Starobilsk, educational process and all services functioning is implemented in the conditions of complicated resource provision. But despite of this the university staff is faithful to own mission. European choice of the university and its intention to join world educational space has particular importance now. About management activity: since 2009 own system of management of educational process quality has been created at the university, necessary organizational and human resource measures were carried out. During 2009-2014 science activity of university was focused on implementation of Program of Science Development at Luhansk Taras Shevchenko National University. According to the program tasks: for the last four years almost all departments chose scientific subjects and registered them at Ukrainian Institute of Scientific and Technical and Economic Information; in 2012 university scientists got 20 useful model patents according to research results; Center for Natural Science was open, etc. Some Program tasks were not performed because of country financial crisis. Accordingly to formulated strategic target and designating main tasks, in the sphere of educational activity of the university for 2010-2014 number of important steps was carried out: system of university education is close to European standards; main elements of ECTS are implemented including transparency and modernization of educational process, etc. But some problems in the field of educational activity are unsolved: insufficient level of student mobility and teacher probation at world leading universities; insufficient percent of disciplines taught in English. In the social and humanitarian field the university staff efforts were aimed at development of student patriotism and respect to Ukrainian cultural and historical values, etc. So the Academic Council confirms that the main tasks of Conception of University Strategic Development for 2009 – 2015 are 80 – 85% performed. Based on the above the Academic Council approved that program of implementing conception of university strategic development was completed with positive result. The Head of the Marketing Department Ihor Lysenko reported about arrangement of professional orientation and advertisement work at the university for 2015. He presented “Complex of advertisement and professional orientation events to attract applicants to LNU for 2014-2015 academic year within the program of support of educational establishment positive image”. The Academic Council approved the Complex. 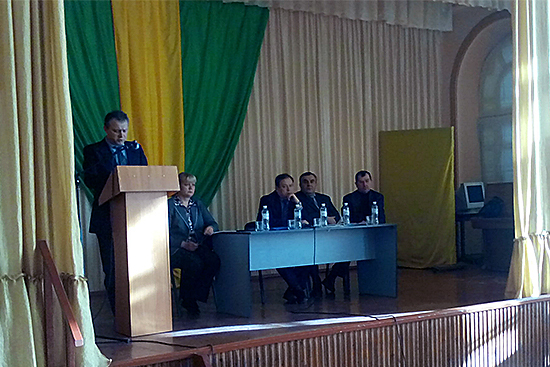 The prorector for scientific and pedagogical work Dmytro Uzhchenko presented competitive works. So the docent Olena Otravenko became the Head of the Department of Theory and Methods of Physical Education and the docent Olena Pavliuk became the Head of the Department Olympic and Professional Sports. The Academic Secretary Olena Karaman presented the list of those who had stand for academic degree. So according to the results of secret voting the academic degree of professor was assigned to Doctor of Economics Andrei Kolosov (Department of Management), Doctor of Education Olena Karaman (Department of Social Pedagogy). The academic degree of docent was assigned to Candidate of Phil. Sciences Dmytro Sorochan (Department of Marketing), Candidate of Pedagogical Sciences Svitlana Perova (Department of Translation Theory and Practice), Candidate of Pedagogical Sciences Yurii Poluliaschenko (Department of Olympic and Professional Sport) and Candidate of Economics Nataliia Riazanova (Department of Finances, Accounting and Bamking). The issues of scientific works were considered as well including the following: approval of annotated report of science and research work (scientific supervisor – Olena Otravenko), recommendations to edit scientific conference materials, recommendations to edit “Visnyk of Luhansk Taras Shevchenko National University” (biological science, medical science), recommendations to edit educational and methodological books, approval of thesis subjects.